Perhaps, perhaps not. Let's view this as is the beginning of an experiment. You: Do you realize those are chilis, Lise? CHILIS! Are you nuts? You aren't thinking of using those in an eye cream, are you? Me: Oooh there's an idea! But, no. Let me set your mind at ease. We're not making eye cream with these. 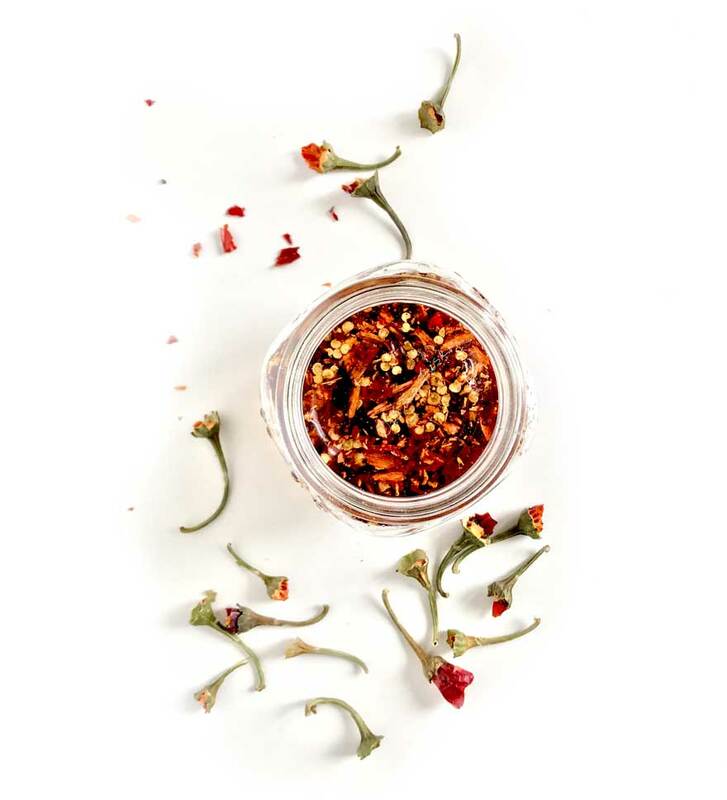 The 4 dried chilis above were originally intended for an infused oil with 'a bit of capsicum zing' to add to a product. If you count the stalks, you'll see 4 times as many ended up in the jar. You: And exactly how did that happen, Lise? Did they just jump in there all by themselves? OK, I'll come clean. I got curious about maximum strength as I was preparing the ingredients. And I had quite a few chilis. So, yeah, they kind of jumped into the jar all by themselves. Tip: When making an infusion with loads of capsicum and feeling tempted to sniff the mixture, sniff very carefully. While this blend is brewing, let's examine what our star ingredient contains. Chili (INCI: Capsicum frutesense) is a stimulant and thermogenic substance (read: it causes a feeling of warmth) and helps encourage blood circulation. It also desensitizes neural receptors which makes it useful for pain relief. The main active component in chili is called capsaicin. Because the actives in chili are oil-soluble, an oil infusion will capture the full range of phytocompounds (ref). And even though other extraction methods will work, an oil infusion won't require any fancy machinery or equipment and can be done simply and easily at home. Used externally (at a reasonable dose), chili stimulates circulation. The cool part? Patch tests have shown there is no 'meaningful irritation or contact dermatitis' (ref), so, used correctly, it won't bother the skin. Although this all sounds like non-stop good news, there are some indications that 'more study is needed (ref). So, contrary to what might have been your first knee-jerk reaction, chili can be quite useful in a cosmetics setting. As a matter of fact, you can purchase chili extract with some cosmetics ingredients suppliers. Apart from all the other cool stuff chili has to offer, the plant has both antimicrobial and antioxidant properties. I know what you're thinking, because I thought the same thing. If it's antimicrobial, maybe we can we use it as an all-natural preservative. Without having researched this, I'm hazarding a guess we would be looking at a similar situation to trying to preserve a cosmetic using essential oils. In order for it to work as a preservative, we would in all likelihood have to exceed safe usage levels by several hundred percent. But I'm just guessing. Please add a comment if you have input on this. And here's a final fun fact: capsaicin is the main component of pepper spray. 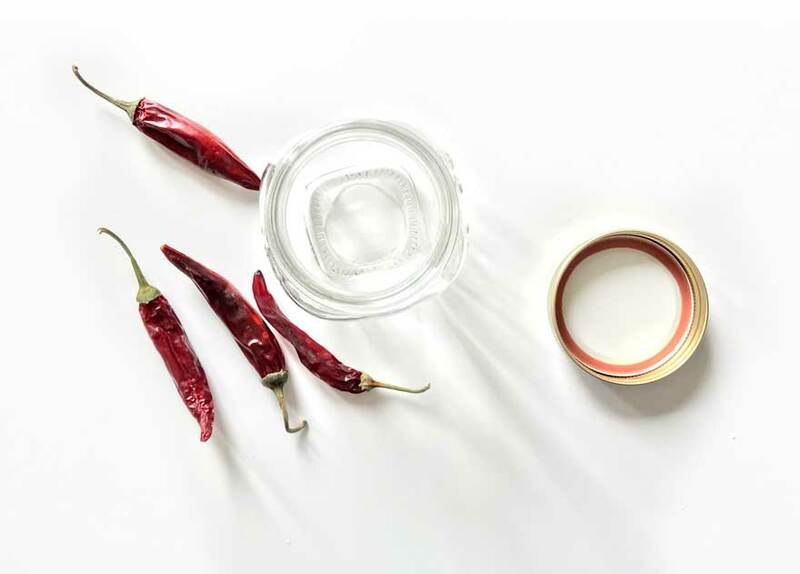 If you're signed up for my newsletter I'll show you how to use a chili-infused oil in a cosmetics product (or maybe even 2). Have you evert used chili in your products? How did you use it and what were your experiences? HI Sharon - that sounds absolutely lovely! Thanks for sharing! I purchased some chili oil awhile back but have not used it in anything yet. It seemed like an interesting ingredient. Maybe I will try it in a scalp oil to see if it helps with reducing hair shedding. HI Michelle - Excuse this tardy reply-- your comment seems to have gotten skipped over! I think your hair boosting idea sounds like a good one. Chili does has a reputation for helping increase hair growth. Las summer I made an alcoholic extract of rosemary and chili that I had totally forgotten about until I read your post. I think it's time to start playing with it and use it in my recipes. Hi Lise. What type of chili’s are you using. I know there are many different heat levels in chili’s.